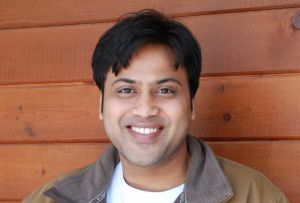 Vishal Agarwal is on a high after attending the Echelon 2011 Satellite event for startups held in Singapore. His was the only Indian company to be selected out of 40 startups across the globe. Agarwal runs the Mumbai-based Spatial Ideas, a geographical information systems (GIS) startup with an online product called Locobuzz. 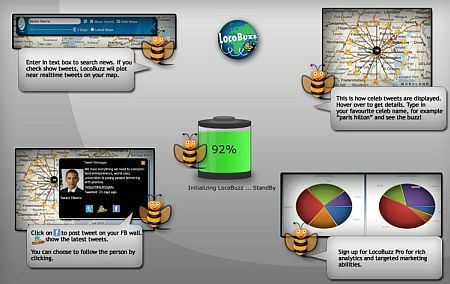 Locobuzz is a platform which layers digital maps with real time tweets of celebrities, Facebook status updates from friends as well as news alerts. You can search, filter and browse through topics of interest while zooming in and out of cities and countries on the map. In other words, it is a map based analytics, query and communications platform which integrates news and tweets onto a map. There are two versions of Locobuzz: one is the 'fun' version (as the founder terms it) which is free and for Internet users. The other is the commercial B2B product aimed at enterprises. "There was tremendous interest in Locobuzz in Singapore and we have returned renergised," says Agarwal. "We hit a low point in our start up journey when we started discussions with investors in India. Global investors are far more excited about the space," he added. He rues that there is a lack of understanding amongst VCs about location based services and the GIS market in India. The idea to integrate maps with social networking websites began when Agarwal saw the increasing use of Facebook and Twitter amongst his employees. "We are a young, liberal, dynamic company and wanted to merge maps with the social networking phenomenon to take it to the next level," he says. In early 2009, Vishal Agarwal, a Penn State University graduate employed at California-based ESRI, returned to India and after a brief stint at another GIS based company Rolta, he decided to start his own company, leveraging his experience in the domain. He started developing the GIS product out of a spare bedroom in Mumbai and in April 2009 was connected via an ex-colleague to a US-based digital marketing company which was looking to outsource its email marketing project. Over the course of the year, Agarwal hired Nitin Agarwal, and the two worked on the original GIS project while continuing to develop software for a single client. "Targeted marketing was an opportunity we used to get started," he says. The contract helped pay the bills and keep the idea going. Through Linkedin, Agarwal connected with various clients in Europe and the USA who were looking to outsource their GIS development and soon closed two long term contracts. One includes a large surveying company based in Hyderabad. He roped in six developers and a graphics designer over the course of a year. In March 2010, the company was registered as Spatial Ideas. They moved into a shared office space soon after. It had taken Agarwal six months to save up enough for the down payment. In all, Agarwal has invested Rs 50 lakhs into the company so far and is the sole propreitor. In November 2010, Spatial bought its very first dedicated server in Canada, which allowed it to start scaling up information gathering at a faster rate. "We realized we could not depend on Indian servers and their down times," says Agarwal. There have been hurdles galore - from not being able to afford the name he wanted to poor Internet connectivity and server downtimes, which was resolved when they bought their first dedicated server. The responsibility of paying his employees every month, on time, also weighed on Agarwal. The starup now has 8 employees and is in a ramp up mode. At Locobuzz.com, the user is first asked to sign into her Facebook account. She can then view Facebook statuses of her connections by zooming into their locations shown on the map. She can also comment directly onto their walls or statuses using Locobuzz. The service does not integrate Facebook's Like button as yet. Locobuzz also shows statuses of Twitter 'celebrities', who are people with the most followers on Twitter. Spatial has selected 300 such celebrities and is continuously adding more to the database. Finally, it offers local and global news from over 200 media companies which are again plotted according to their location. Spatial began by integrating news alerts with digital maps. It chose Microsoft Bing Maps as a base and Agarwal said the reason was superior map quality and the fact that it is free for developers. Locobuzz is based on Microsoft's Silverlight technology. Ten RSS feeds of news sites were added to a digital map to begin with and this slowly grew to 200. Categories include finance, sports, entertainment, breaking news as well as localised news. Users can share these news alerts along with their comment on Facebook via Locobuzz. Next, a database of tweets by Indian and international celebrities was added to Locobuzz, allowing users to view where their favourite star was tweeting from and what it was about. Finally, the question of where the big bucks in the segment would be, popped up and Agarwal decided to tweak Locobuzz into a B2B platform for enterprises who were starting to show interest in social media marketing. In January 2011, Reliance BigFlix discussed a use case for Locobuzz to power a social media marketing campaign for the movie Dhobi Ghaat. This is when Agarwal decided to target media and entertainment houses, telecom companies and large consumer brands. This B2B platform offers in-depth analytics to the Tweet or status update level of millions of users, high level 'Locobuzz Reports' and competition analysis for the managers as well as the ability to view, on a map of the world, in which areas the company's social influence extended - where there was a lot of buzz about the company, what kind of reviews, comments and complaints were being shared across online networking sites and much more. The company has also created a sentiment analysis engine that labels tweets by consumers as neutral, good or bad. "This is so managers can immediately quantify and qualify their marketing campaigns. They can decide their high level road map for marketing using the reports and determine what is the level of buzz about their brand in any particular location," explains Agarwal. It offers 5 types of Locobuzz reports - Information Quantifier, Market Share, Market Fortnightly, Market Variation and Tweet Maps. These allow enterprises to determine significant dates, tweets and news, with their locations. The B2B platform's Twitter Control feature offers the action of click to read a particular tweet about the brand. "A company can directly mail and connect to a disgruntled consumer as well as view what consumers of competitors are saying," said Agarwal. The B2B platform has been tested and is now commercially available. It is priced at a one time fee of Rs 40,000 and a monthly subscription cost. Spatial plans to add alerts from other online networks such as photo sharing site Flickr, video sharing site Youtube and Wordpress blogs to Locobuzz. It has partnered with Singapore-based CRM company Interaktiv to resell Locobuzz in the country and is now mulling a joint venture. Meanwhile Spatial continues to add more local and international clients in varied sectors - from Bollywood to luxury resorts and environment related firms. Mumbai-based Teracon Ecotech Pvt Ltd, which commissions trees and carbon credit exchanges for the government, is in the final stages of signing a formal partnership to use Locobuzz.